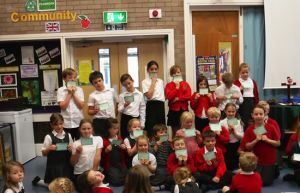 Husthwaite CE Primary School & Nursery are thrilled that they have been awarded a ‘GOOD' grading by their recent church inspection. The lead inspector was very complimentary about the school's ethos which reflects the Christian values the school holds which help to support and develop children's learning, stating that "pupils make good progress in lessons and develop well in such an encouraging environment". The Inspector further reported that a clear vision for the school is evident based on the School's values "so that pupils are happy, make good progress and behave exceptionally well". It was also noted that the leadership and management of the school is good and that "standards of achievement are at least as high as expected, and behaviour and relationships are excellent". Mrs Bainbridge, headteacher, said "I am extremely proud to be headteacher of a school where a caring ethos and Christian values are interwoven into all aspects of school life here at Husthwaite. The report support that we are a happy school with supportive staff which is evident through the good progress children make. Our strong links with the Church and community further enhances the development and wellbeing of our pupils".